From left are Aziel Snyder and Chuck Klock who first place tournament. 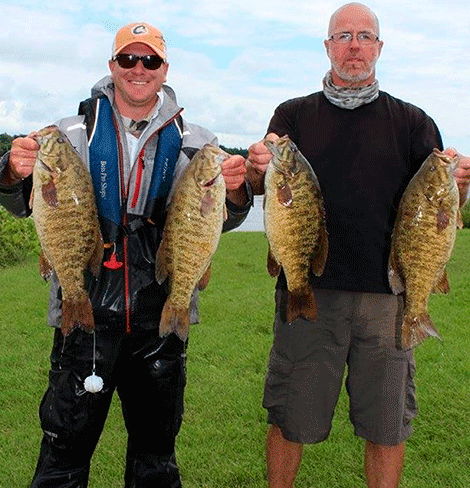 The Northern NY Bassmaters competed on Lake Ontario at Chaumont Bay on July 15. The weather conditions made things difficult and most teams were forced to stay in the bay. Taking first place were Aziel Snyder & Chuck Klock of Alexandria Bay and Theresa with 23.77 pounds. Second place went to Tyler Capella & Jesse Spellicy of Canton & Gouverneur, with 19.78 pounds. Chris and Anglea Roach of Heuvelton, took third place with 19.78 pounds. Fourth place went to Brad Paradis & Robert Paradis of Ogdensburg, with 18.58 pounds. The next event for the NNY Bassmasters team trail will be on the St. Lawrence River out of Ogdensburg on Aug. 12. Weigh in is at 3 p.m.
People who want to see the action can stop at the Patterson Street launch.